At last week’s city council meeting, city staff presented a high-level overview of some of the city department’s challenges and positives that our recent growth in downtown Raleigh has created. This is in response to downtown developer Greg Hatem’s comments about the vibrancy in the city center. Also discussed was Raleigh Union Station and a plan to cover cost increases. If the embedded video doesn’t show, jump to the city’s website to watch. It starts at 1:15:22. During the January 20, 2015 meeting the City Council heard comments from Greg Hatem (Empire Properties) regarding vibrancy in downtown Raleigh. Staff was directed to prepare a plan evaluating the various elements involved in the growth and increased activity downtown. A presentation will be provided by staff outlining efforts currently underway and proposed next steps to address the issue. I really enjoyed this presentation by our city’s staff including City Manager Ruffin Hall’s introduction. Sure, Greg Hatem may have made a claim that downtown Raleigh is “unlivable” but the report shows that there are many factors going on here and his story could be just a small piece of the downtown pie. It seems like staff and the council recognize that collaboration between many entities is necessary to move downtown towards the adopted vision, the one being discussed in the latest downtown plan. This is why I love downtown. It’s a place with a highly complex fabric of services and uses that should be enjoyed by all Raleigh denizens and visitors through variety and balance. This conversation questions the downtown Raleigh nightlife and whether it is in balance with the rest of her uses. From the city’s point of view, there are concerns. If I was in a wheelchair, how would I get across a sidewalk that’s packed with bar patrons? When Fayetteville Street is packed with taxis and cars, how does an emergency vehicle get through to treat someone? Is the trash that’s leftover healthy for our air or water when it runs off? How do you balance all that but not stifle growth and economic development? In my opinion, these side conversations need to be taken into the new downtown plan and documented. That way current and future city leaders have a reference to work with as downtown grows and new issues are presented. There isn’t one clear cut answer for each challenge but the answer becomes easier when all parties are working together. If the embedded video doesn’t show, jump to the city’s website to watch. It starts at 1:47:20. 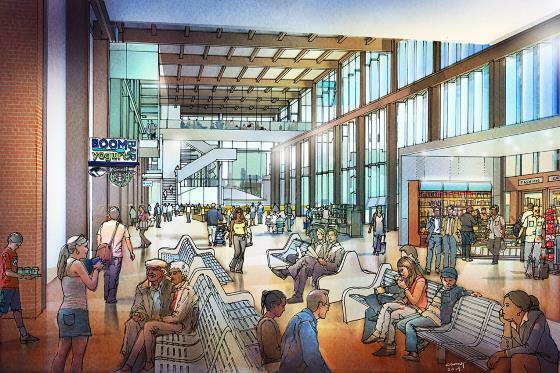 The council unanimously supported spending more money on Raleigh Union Station in order to make up for rising utility costs and property values. Staff did find ways to reduce costs of the project, some being cutting the planned stormwater garden and changing up the platform, in order to keep things moving forward. Leo,is the start date stil the same? Or has it been pushed back? @Adrian; it was supposed to start this month, but as far as I know the start date has been pushed to May. Someone please correct me if I am mistaken. I have not seen a confirmation that the groundbreaking has been moved but I am not disagreeing with Jake’s comment either. We are less than 2 weeks out from the announced groundbreaking date. I would be very surprised if it was pushed back at this point. With no new date announced at this late stage. But I could be wrong. At this point I’m past ready,for this to get going. Like don’t know about everyone else. But I’m ready to see some gold shovels and hard hats. Heck I’m even looking to Governor McCrory getting another photo op. I emailed the city and received a response back saying they are finalizing a groundbreaking date and should have an announcement later this week. Great news! That area is gonna look awesome once Union Station and the developments being planned for the warehouses come through.